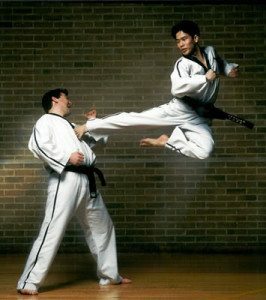 Most people except that the general term “martial arts training” is associated with the oriental style of fighting, Karate, Judo, Aikido, Tae Kwon Do, Gung fu…etc. However saying this is the world of martial arts training would be the same as saying every light in the sky is an Unidentified Flying Object is a space craft from another world, you may not be able to identify every light in the night sky, so yes they’re UFO’s, but that doesn’t make them “alien space craft’s”. Just because a martial art is not of oriental origin, doesn’t mean its not a real martial art and definetly doesn’t mean its not effective! In simplistic terms martial arts training should be looked at in the same manner, yes it’s martial art training but is it oriental? Many fighting of Pugilistic art forms are not thought of as martial, Western Boxing, English, Scottish, French, German, Italian and Portuguese Fencing, Pankrasion (a Grecian mix of boxing and wrestling), Roman Gladiatorial combat, French cane and English single stick. 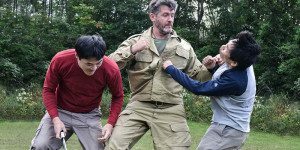 To begin with the actual term “Martial Arts Training” is in fact telling you this fighting style is a “military art”, and not all fighting arts are in fact military. Some of the best fighting arts have been developed by a people who have found the need to learn to fight for the protection of their loved ones from an invading military force, or maybe a neighbouring tribe. This form of warfare leads to the most ferocious and cunning fighting styles. If we look at the classic comparison of the invasion of Okinawa by Japanese forces in 1609. It is now believed to be true that on the subjugation of the Okinawa people, the Japanese over lords forbid the native people from carrying arms. This left the Okinawa people defenceless and therefore at the mercy of the invading forces. It was accepted for many years that this situation was catalyst that forced the creation of the fighting art of Kobudo. Kobudo was a Japanese term actually coined in or around the 12th century meaning “old martial way of Okinawa“. This in itself shows that the Japanese were aware of martial art training already existing on the Okinawan island chain, the “RyuKyu” islands. If we also take into account the removal of arms, it shows the Japanese were very aware of a potential uprising from the native people. There is also evidence of trade between the Okinawan people and the Chinese mainland which is approximately 720Km away. This would mean that the Okinawan traders would have witnessed Chinese fighting arts including their weapon wielding arts and would likely have had formal martial arts training. This training and information would have been transported back to the Okinawan schools and; as with the Mixed Martial Arts Training of today, used to strengthen and improve their own fighting technique. This leads to one conclusion the fighting art of Okinawa, Kobudo did utilise farming implements, such as the Kama (rice sickle), Sai (trident), Tonfa (rice grinder), and Nunchaku (rice flail). With other implements such as the Eku (oar), Bo (6ft staff), all things that would be ready to hand but not constitute an item designed primarily for the making of warfare. These items would have been recruited into the Okinawan fighting arsenal as a matter of necessity, but their development as fighting weapons was pushed into being by the feudal circumstances the Okinawan people found thrust upon themselves by the Japanese invasion. So the art of Kobudo is not, by definition a “martial art”, it was not created by a military body. It was however, created as a direct response to military action and is therefore a “fighting art”. There are many martial arts that are not military martial arts, but today the term is excepted as all encompassing. In the south west of England we have an eclectic selection of martial arts training as anywhere else in the country. In Exeter in 1972, there was just Judo and Shotokan Karate. 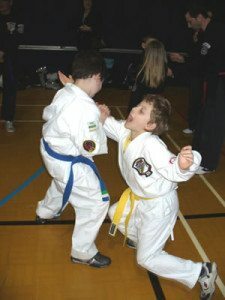 Presently there are well over 20 schools of martial arts training in Exeter, and many more schools of martial arts training in the surrounding areas in Devon such as Plymouth, Paignton, Torquay, Newton Abbot, Dawlish and Exmouth. The difference in martial arts training and the students ability to learn to fight can depend upon many aspects of that training, the instructor, the type of martial art itself, is it a kicking art, grappling, striking, full contact, non contact or many, many more. When arts are compared there is generally more or less many aspects that are compatible or even interchangeable. Comparing two well established martial arts American Kenpo (sometimes called Kenpo Karate or Ed Parker’s Kenpo) a combat effective street fighting system that can trace its roots back to the Shaolin temple on Mount Song, near Dengfeng, Zhengzhou, Henan province in China, and therefore Oriental in heritage. And Systema, a 10th century fighting art that was developed to defend a country from invaders, and later taken by the Russian armed services during the time of the Russian Soviet Federative Socialist Republic and militarised for the specific use of the special operation units the Septsnaz still for the purpose of defending that same country, Systema would have been influenced by many different other fighting styles, but is fundamentally Russian in heritage. Analysing these two devastating martial arts we can see they both approach the goal of being a complete martial artist who can react to the situation and formulate an answer. However, they approach this goal from two completely opposite directions, American Kenpo being an external martial art, whereas Systema is an internal art. This is a factor that usually means the martial arts training is classed as hard styles and soft styles, and I suppose you could say that about these two different arts. However, clinically Kenpo is controlled by the student learning to fight, but under the control of external factors, Kenpo is a technique specific system which students must learn to progress. These consist of a set number of self defence techniques, forms, sets and basics per belt grade. This is a method of learning to fight by the use of points of reference. It gives the student a structure to work within. This method is one that children feel most comfortable in, knowing what to do and when to do it. It is a method of Learning to fight that definitely does work, and is the most common method of training. However, it can be too comfortable and some students do not push the boundaries of their abilities tending to stay within their comfort zone. This then becomes the duty of the instructor to push the student beyond his or her limitations. Systema on the other hand has no specific structure, no techniques, no testing, and no syllabus. It does also have points of reference, breathing, relaxation, freedom of movement, and posture. However, these points are within the student, and their ability to push their boundaries by themselves. This places the student internally fighting his or her own frailties and pushing themselves out of any comfort zone and beyond their own limitations relying on themselves from the word go. The student learns to fight their self first, because if they cannot win any internal fight with themselves first, they will not win a fight against an opponent. These two distinct approaches to martial arts training do in fact support each other, looking at the differences in these arts. Kenpo’s base techniques can be aided by the unique ability of Systema to take a situation and find a multitude of answers, as much as Kenpo’s vast library of fighting scenarios gives the student a working base line of fighting knowledge. Systema’s relaxation and breath control serve to quell panic in stressful situations. Kenpo can look at specific situations and analyse the consequences of natural reactions to strikes giving an unstressed baseline of what maybe expected. A situation of almost symbiosis can occur within these arts as no doubt for many others, and it brings a very old adage comes to mind every time these comparisons are made “opposites attract”.